Be Part Of A Beautiful Smile. Join our growing dental practices in Southern Indiana. Our state-of-the-art facilities offer an excellent workplace and allow us to focus on providing outstanding dental care to patients of all ages. We have a fast-paced, family-oriented environment that supports career-oriented professionals who share our vision of care. Compensation, benefits and training are geared toward creating a superior dental care team. Check out our open positions below and get started on your career with Denzinger Family Dentistry. Help us create beautiful smiles. EDDA Full Time Expanded Duties Dental Assistant – Show us how you love taking care of beautiful smiles! EDDA license preferred. Superior knowledge of dental assistant procedures and terminology. Excellent communication and patient care skills. Compensation package based on experience. Front Desk Associate Full Time Front Desk Associate – Interact with patients by scheduling appointments, checking patients in and out and coordinating communication with dentists. Previous experience in a dental practice and knowledge of dental terminology helpful. Excellent communication and patient interaction skills. Compensation package based on experience. 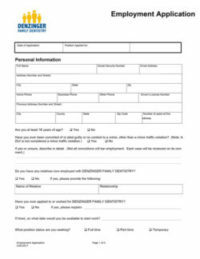 Download and print the employment application at left and send it back with any other documents you want to include for our consideration.